Routledge Performance Practitioners is a series of introductory guides to the key theatre-makers of the last century. Each volume explains the background to and the work of one of the major influences on twentieth- and twenty-first-century performance. Robert Lepage is one of Canada’s foremost playwrights and directors. His company, Ex Machina, has toured to international acclaim and he has lent his talents to areas as diverse as opera, concert tours, acting, and installation art. His most celebrated work blends acute personal narratives with bold global themes. a variety of practical exercises designed to give an insight into Lepage’s creative process. As a first step towards critical understanding, and as an initial exploration before going on to further, primary research, Routledge Performance Practitioners are unbeatable value for today’s student. Aleksandar Saša Dundjerovic is a Senior Lecturer in Theatre Performance at the University of Manchester and a professional theatre director with international experience. His books include The Cinema of Robert Lepage: Poetics of Memory (2003) and The Theatricality of Robert Lepage (2007). 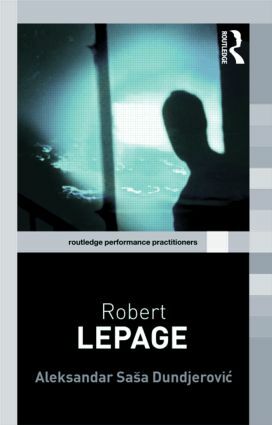 Routledge Performance Practitioners is an innovative series of introductory handbooks on key figures in twentieth-century performance practice. Each volume focuses on a theatre-maker who has transformed the way we understand theatre and performance. The books are carefully structured to enable the reader to gain a good grasp of the fundamental elements underpinning each practitioner's work. They provide an inspiring springboard for students on twentieth century, contemporary theatre and theatre history courses.